Social media is a fast, free, effective way to promote your home business. However, there is a method to the social media madness not just in posting content people want to talk about, but in building a following. No doubt you’ve seen offers to sell you thousands of followers and you might be tempted to take advantage of them. However, that can lead to problems including loss of your account. If you’re focused on quality followers who want to know what you say and buy your products or services, the only way to get them is by earning them. 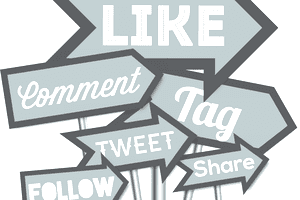 Here are tips for increasing your social media followers. People aren’t that interested in knowing what you had for breakfast unless of course, you’re a food blogger. When it comes to social media marketing, the goal is to keep your market informed about the topics related to your business. For example, most of the stuff I share on social media has to do with home business or telecommuting because that’s why people follow me. What works on Twitter, doesn’t necessarily work on Linkedin. Not only do the types of messages you send vary across networks, but frequency as well. You can post 10 to 15 Tweets a day and not bother anyone. However, 10-15 LinkedIn posts might appear obnoxious. Take the time to learn and study the social media networks you use and fit your posts to each. This includes every page of your website (I’m surprised when I have to hunt down social media follow buttons on a website). Your website isn’t the only place to include links. Your social networks may allow links to other network profiles. Finally, include links to your social profiles in your email. Twitter is the king of hashtags, which is helpful since the conversation moves at lightning speed. Hashtags help people find content on the topics that are of interest to them. Use of hashtags on other social media sites can be helpful, but don’t overdo it. Remember, people want to see real content, not a bunch of #s.
One of the biggest frustrations in social media is not knowing what will go viral and what won’t. The best rule of thumb is to post helpful, relevant content for your market. With that said, your social media and website stats can help you determine what’s popular.